You’ve no doubt felt this weekend’s warm-up. It would be very hard not to notice, coming from that frigid end of the week we had. 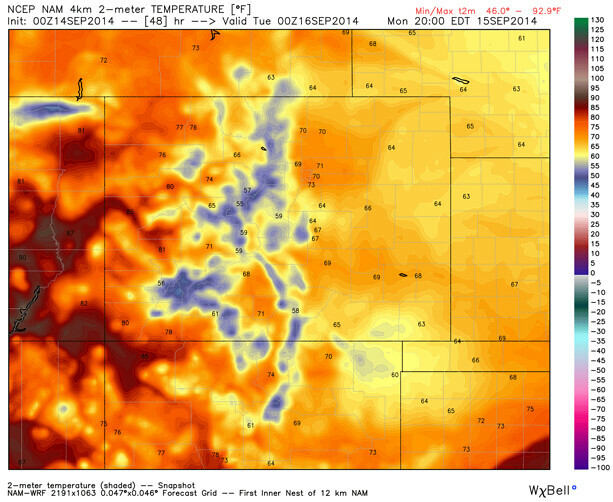 Friday and Saturday morning were both within 2-degrees of setting record lows at DIA. The trace of snow Friday morning did not qualify as a “first snowfall” so officially Denver hasn’t had its first snow yet. Look at us now, back to average temperatures this weekend. Hold the presses though, we have another shot of colder air to move through tomorrow. A weaker cold front has moved into Wyoming, and will push over northern Colorado the next 24 hours or so. This one will bring only a minor dip to the temperatures, but still a noticeable one. Highs in the 60s and low 70s to start off the week. This system doesn’t pack nearly as much punch as late last week’s cold blast did, and doesn’t have the moisture to work with either. Spotty storms, and some cloud cover are expected with the weak upslope flow on Monday. By Tuesday, this system will have moved out and we are back to another warm-up. All global and climate models indicate warmer than normal temperatures for us this mid-week. That is directly in-line with the 500mb height pattern indicating some ridging and warming temperatures. Indicated 500mb heights usually put the Front Range in the middle 80s, and luckily that’s right where ensembles keep the highs for Denver through Thursday. Good agreement is always fantastic. Oh, but wait. That good agreement tends to fall apart a bit later this week and the weekend. By Friday another front will move through, relatively weak again, with a decrease in highs and improved rain chances. The disagreement between a cooler GFS, and a warmer ECM is a minor difference of 5 or so degrees. Regardless, I fall back to my 500mb heights and that does drop our highs back into the 70s for sure. This time around, though, there will be more humidity around for the trough to work with to foster rainfall. o, rain chances appear, at least now, to be in the 30-40% range to end the workweek and start the weekend. These next two systems are relatively minor. 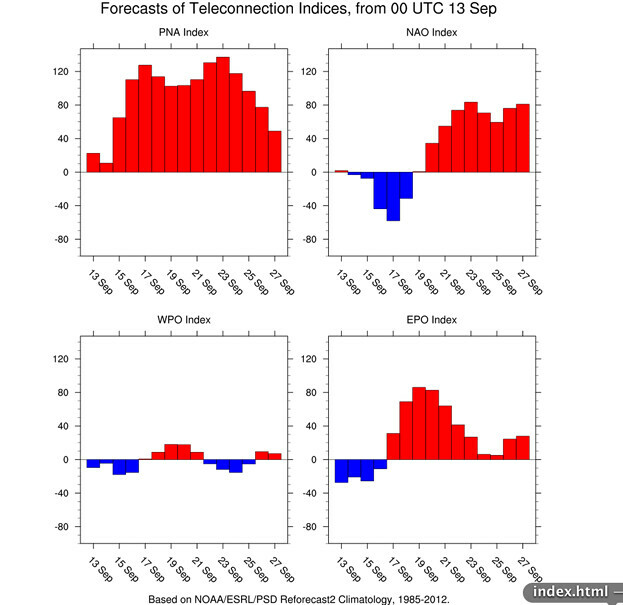 However, we have our eyes set on the end of September and first two weeks of October for something more significant. We’ve mentioned that timeframe before… two significant troughs will be moving through the region. As depicted in the European, the 500mb pattern is anomalously shallow. That is a strong indication that these troughs will drag significantly colder air over the surface and down over Colorado. There is a slight deviation to the strength of both if you look at the CFS projections for the same events. The climate model prefers a less significant cooldown. Although both situations are plausible. Both do show that we will see colder than average temperatures in the first week of October and then again the second week. The difference is amount of cold air. I’m leaning toward the ECM based on past performance, however we can confirm that with better data as time gets closer. We’ll keep an eye on the teleconnections to see if the AO, PNA, EPO and WPO give us indications as to the strength of the cold. We’ll have to wait though for that as those forecasts a reliable starting 14 days prior to an event. In the meantime, enjoy the relatively warmer than normal pattern the rest of September (aside from some brief cooldowns along the way). 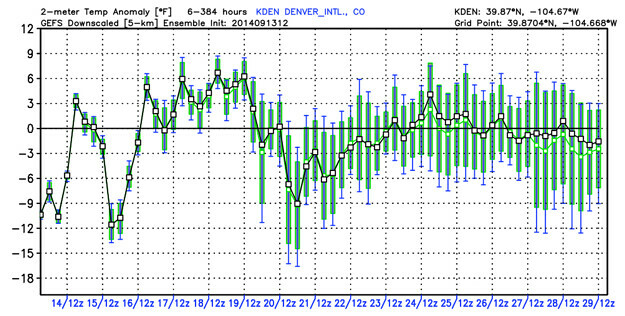 This is quite a shift from the early half of the month, which has Denver 5 degrees colder than average to date.